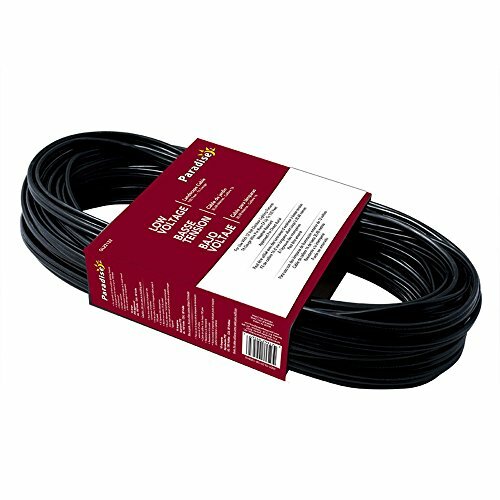 The Paradise 100 ft. 16 gauge SPT-2W landscape wire GL22132 (black) is compatible with any low voltage landscape systems. With its long length, the Paradise 100 ft. of 16/2 landscape Wire is ideal to reach the end of your front or backyard, without getting any voltage drops. This professional grade landscape wire provides optimal and consistent power to your lighting fixtures. UL Listed, safe for outdoor use and to be buried. 1-year warranty. OUTDOOR LIGHTING CABLE:Perfect to use with any 12V low voltage landscape lighting systems. COMPATIBLE:Paradise Garden Lighting's 16, 14, or 12 gauge SPT-2W landscape wire is compatible with any 12V low voltage light systems. EASY INSTALLATION:Brighter and more efficient than solar lighting, low voltage systems never have been easier to install.